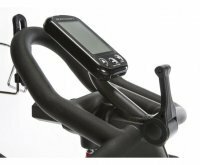 Introducing the revolution in indoor cycles with the Bodycraft SPR Indoor Club Group Cycle. 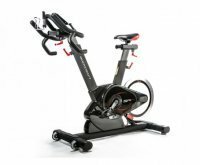 There are many indoor cycles in the marketplace but none provide the smooth feel of the Bodycraft SPR Indoor Club Group Cycle. Rated highly by many users and Fitness experts gives this Indoor Cycle the number one spot on our list for home and institutional use. 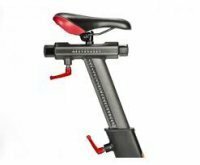 With its high quality and smooth feeling, its no wonder why many customers are buying the Bodycraft SPR Indoor Club Group Cycle over other top name Brands. 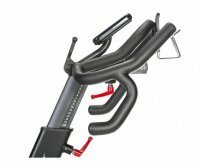 Bodycraft SPR Indoor Club Group Cycle is a leading indoor cycle in the fitness industry. BODYCRAFT EDDY CURRENT TECHNOLOGY ensures you will always be at your optimum level. Stand up and pump for High Intensity Training, the BODYCRAFT EDDY CURRENT TECHNOLOGY delivers! Automatically reacts to reduced demand for rest periods, and lower intensity demands. 16 levels of Eddy Current Magnetic resistance controlled with adjustment lever and displays levels on included computer with feedback. 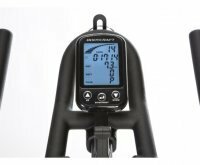 Displays important info including - Level, Speed (MPH/KPH), Distance (M/KH), RPM, Watt, Calories, Pulse, Goal Setting includes Time and Distance. Fitness Warehouse is an Authorized Dealer for Bodycraft Product. You will be receiving the full manufactures warranty. Your warranty covers Lifetime on frame, 5 Years on all parts, 90 days on wear items, 1 year on computer and 1 year coverage on labor.